A Complete Podcast Solution that includes a Free WordPress Site with Media Hosting. 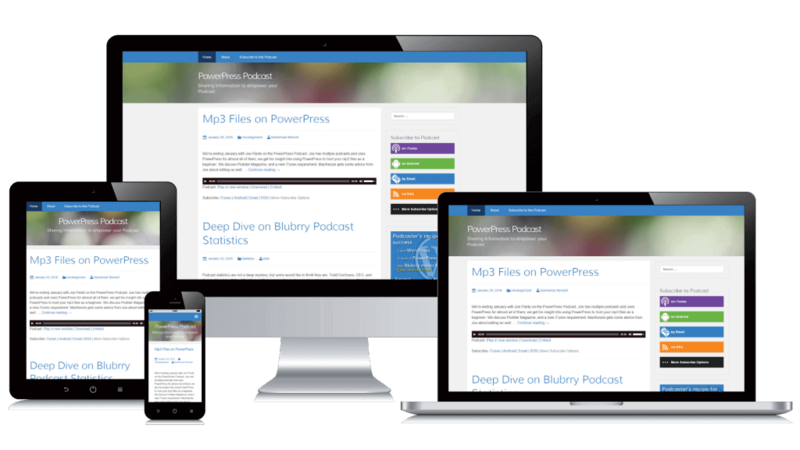 PowerPress Sites is the most comprehensive podcast package available, which includes a managed WordPress site, podcast media hosting and professional podcast statistics. PowerPress Sites offers everything you need to build and grow your show and accurately measure your results, whether you are an independent podcaster or a large-scale media group. Pick what you need and stack them up to build the ultimate, customized podcasting package. Host your podcast with the most reliable, iTunes compliant media hosting. Track your growth with professional statistics. It’s included FREE with any hosting plan! Easily customize your site and publish your podcast all in one place. Ultimate podcast package in one simple service. All PowerPress websites are tailored for modern Web browsing and use responsive design to give you a site that looks amazing on any device. Each site comes with essential plugins to include social media tools recommended by top podcasters and the Blubrry team. Apply your own branding and select your own color scheme to the podcast optimized templates. All listed features are available in the Basic Site. Advanced features are available in higher levels. PowerPress Sites is built upon a foundation of Blubrry’s 10 years of experience in podcasting. Our technologies have been refined over the years to provide a well-rounded online listener and podcaster experience. Whether you are starting your podcast or migrating from a different company with hundreds of episodes, our service combinations provide a customized fit for any podcaster. For the personal podcast, the Basic plan allows users to create a branded podcast website where you can blog with an optimized theme and use essential plugins, all with our quick start tools. With PowerPress Sites, design a mobile-ready site as well as a 100 percent iTunes ready RSS feed. Professional Sites are for those who are ready for unlimited opportunities and flexibility with their website. Build a membership site where your listeners pay for your premium content, and have the flexibility of a dedicated server without the hassle. All server services are managed by the Blubrry team.